Oh. My. Goodness. What a little cream and cheese won't do for vegetables. I've raved over cauliflower before, it's a favorite low-carb, low-calorie vegetable. But add some carbs and calories ... oh.my.gracious. Did I say that this is really really good? It is. But the real trick with this cauliflower is the anchovies, which generate a remarkable sweetness, a memorable depth -- and not one bit of fishiness. I'm willing to bet: you won't 'taste' anchovy, you'll just think, Wow, this cauliflower is wonderful. STEAM CAULIFLOWER: Put steamer onto boil. Trim cauliflower (remove the leaves, cut a deep V into the core and remove it) and cut into small florets (bite-size is good). Add to steamer and cover, cook about 7 minutes or until a knife inserted into a thick stem releases easily. (The cauliflower won't really 'cook' any more, just reheat, so make sure it's the texture you like.) Remove from heat and uncover to cool a bit. Transfer to a baking dish. 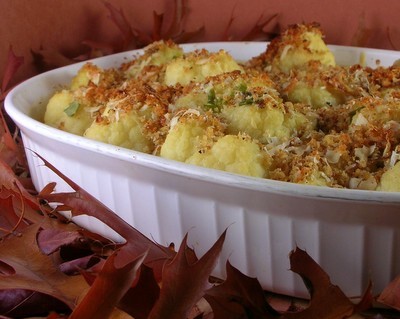 TOPPING: Mix the topping ingredients, spread evenly over cauliflower just before ready to bake. BAKE: Bake at 400F for 20 - 25 minutes if done right away, while cauliflower is still hot. If baking from room temperature, I'd allow 30 - 40 minutes. If you use a rasp-like microplane to grate Parmesan, you just might need two, a ribbon microplane as well a fine microplane. And if you're following a recipe exactly, you'll want to measure by weight, because the volume differences are enormous, just look at these two piles of Parmesan, grated from two chunks of the same weight. This sounds just amazing. I think cauliflower is turning into my favorite vegetable. I agree with Kalyn! GO Cauliflower! I normally add bits of smokey ham to the whole dish which gives it a great flavor. Cauliflower has to be one of the strangest veggies. Most everybody starts out thinking they don't like it. The lucky ones then find one or two recipes that make it a beautiful veggie and this looks like one of them. Hooray! I realized later that I forgot to say AWESOME photo with the autumn leaves in front of the dish. And I like Meeta's idea with the ham. I am a huge cauliflower fan and I think the anchovy here is brilliant. Thanks! sounds delicious! I love cauliflower and with that cream, what could be better? Wow. That looks and sounds great. I've just seen a couple of cheesy cauliflower dishes on Ivonne's Dishes of Comfort post; I have a cauliflower on hand, and anchovy paste, and parmesan -- think I'll try this tomorrow evening. Thanks for ALL of the wonderful Thanksgiving vegetable ideas. Kalyn ~ It's gorgeous, no doubt. Lately I've been finding locally grown heads at the farmers market, too, and they're so fresh! And thanks, I'm getting some hang of the photo business, I think! Meeta ~ Ham would add a whole 'nother layer, for sure. Tanna ~ I just can't imagine not liking cauliflower. Christine ~ You're welcome. The anchovy is indeed wonderful. FitGal ~ Thanks for stopping in! Cauliflower and cream: a definite match. Lisa ~ Let me know how it goes! I hope you love it too! Very good flavor, but needs thickening for the sauce. it was completely soupy. I drained it before serving. Oh my goodness, Alanna, you're right!! My husband was very excited to try this (I was a little nervous) but the anchovy does indeed add that certain je ne sais quoi! Not fishy at all and I get the impression that we'd miss it if it weren't there. Brilliant! What might be substituted if 'afraid' to try anchovy? Andi ~ Anchovies are what makes this dish special, the 'signature' ingredient, if you will. Therefore I don't recommend a substitute but perhaps, if you're so inclined, another recipe. Or better yet, gathering courage! Andi - That's not being 'afraid' of fish, that's keeping a healthy ocean between you and them!